WEARING THE LETTER P named an Indie Award finalist! We are pleased to announce Wearing the Letter P: Polish Women as Forced Laborers has been recognized as a finalist in the annual Foreword Reviews’ INDIES Book of the Year Awards in the History category! View the press release here. An unflinching, detailed portrait of a forgotten group of Nazi forced labor survivors. 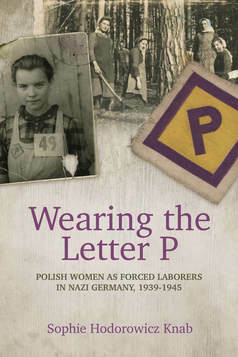 Written by the daughter of Polish forced laborers, Wearing the Letter P gives a voice to women who were taken from their homes as young as 12 years old and subjected to slave labor conditions, starvation, sexual exploitation, and forced abortions and child separation--all while Nazi propaganda depicted them as well-cared-for volunteers. Knab provides an important contribution to World War II history, based on archival records from the U.S. and Europe, family records, war crime trials, and previously unpublished victim accounts. Hippocrene has built a strong Polish interest list over the past 40 years, including ﻿Poland: A History﻿, Fighting Warsaw: The Story of the Polish Underground State; Polish Customs, Traditions, and Folklore; ﻿Polish Holiday Cookery, and many more. Celebrate your heritage by learning more about Poland's history, practicing your Polski, and sharing your favorite Polish dishes! Most books about espionage in the American Revolutionary War tend to focus solely on General George Washington, but as noted historian Donald E. Markle explores in this fascinating account, there was an entire system of intelligence communication autonomous from his direction. General Washington and General Charles Cornwallis were engaged in a constant battle to outmaneuver each other, and Cornwallis seemed to always be one step behind Washington and his intelligence departments. As the war progressed, the Americans and British slowly learned one another's tactics, allowing the hunt between the fox (Washington) and the hound (Cornwallis). in the battle for freedom. A moving Holocaust memoir from a medical experiment survivor. In February 1941, Wanda Połtawska was arrested by the Gestapo. She was nineteen years old. Charged with aiding and abetting the resistance movement a heinous crime in Nazi-occupied Poland she was sent to the notorious Ravensbrück concentration camp. And I Am Afraid of My Dreams is Połtawska's account of the four years spent in the camp, where the prospect of death, whether from starvation, exhaustion, or summary execution, was a daily reality. Originally written nearly fifty years ago, this powerful story is an enduring testament to the courage of the human spirit. Wanda was used as one of the camps guinea pigs and became a victim of cruel medical experimentation by Nazi doctors. Many of her friends died or were left with horrific physical and psychological injuries as a result of these experiments. Wanda bravely faced each day and pledged to become a doctor if she ever got out alive.